To make a proper bundle that contains everything, you can use my hacked-up macdeployqt, maybe. It not only deploys qt and the qt plugins to the bundle, but also kde plugins. 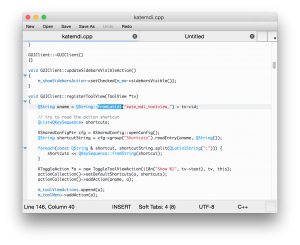 It’s in here: https://quickgit.kde.org/?p=scratch%2Frempt%2Fkritadeposx.git, together with a bunch of notes. It’s still Qt4 based, but the principle is the same, and I’ll have to update it to Qt5 soon. (I’m also using this repo to store the external cmake projects I’m using to build deps). I patched the current macdeployqt to just deploy all plugins inside the qt plugin dir and installed KF5 plugins there, too. That worked, I have now two .dmg with KWrite and Kate. Kate plugins are even found, as they rely only on the qt plugin system. Unfortunately for KIO, the protocol files are not found (because I don’t package them and the path won’t match). Will think about that until my other review requests and the dependency stuff is done. @Christoph What do you think about having the developer documents (build instructions, good practices and notes) at http://community.kde.org/Kate? This is so awesome. I would really love it if you could make a .dmg package available for Yosemite/El Capitan so I can use this at work when I develop Ruby-on-Rails apps on OSX. Then I can switch to Kate completely. Thanks for this work you have done. Hi, I hope to get there somewhen, but the current state is really useless. You can open files and save them, some plugins do something, but already KIO does nerv around with ugly error messages and stuff ;=) And that all with my patches that I applied locally. I will first try to get in the necessary fixes, than I can think about providing some “testing” .dmg.